Poor Dee-Jay, stuck as an extra member of the less than popular Battle Force 2000. To further add to his misery, the guy debuted and died in the same comic issue. And don’t get me started about his funky boots. Possibly the explanation for his boots lies in BF2K’s mission as a testing ground for future weapons. Somewhere in 1986, there was a skunkworks set up just for designing future combat footwear. That’s the best I can come up with. Maybe it’s because the first version came out after my kid toy collecting days were over, but I just don’t get Dee-Jay. At all. 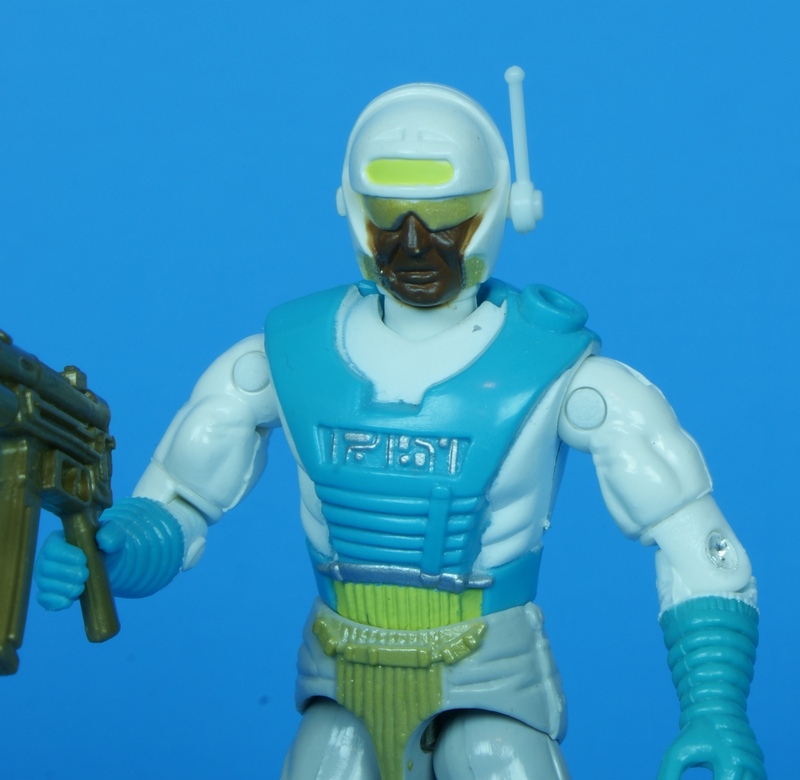 Maybe as a reprieve for his original short shrift, he was given a re-release as part of the Arctic Commandos mail-in set. Deej was a key member of the team according to the file card. Cobra had a powerful laser set up on Mt. Everest, and it was up to the Joes to take it out. That’s right, a late line mail-in came along with a nice little storyline. Actually, the single file card just made up for the fact that each figure didn’t get its own separate version. In the story, Dee-Jay ‘s job was to plant explosives on the laser, a pretty tough assignment, and one that doesn’t seem at first to fit within his MOS. However, as the man has a lot of communications experience and is described as a whiz when it comes to technological improvisation, I can see how they might tap him for the job. Okay, I’m probably grasping at straws in trying to explain the shoehorning of a weirdo like Dee-Jay into such a straightforward mission. I find the figure itself to be much more appealing than the original version. The new cold weather uniform color scheme is more cohesive than the multicolored mess that proceeded it. The figure doesn’t embarrass itself too much, beyond being a bright 90s release. Although he didn’t get to keep much of his unique comm gear, his helmet antenna was thankfully included. Even though I’m a sucker for cold weather Joes, and as much as I love baby blue, I still find the figure to be a head scratcher. 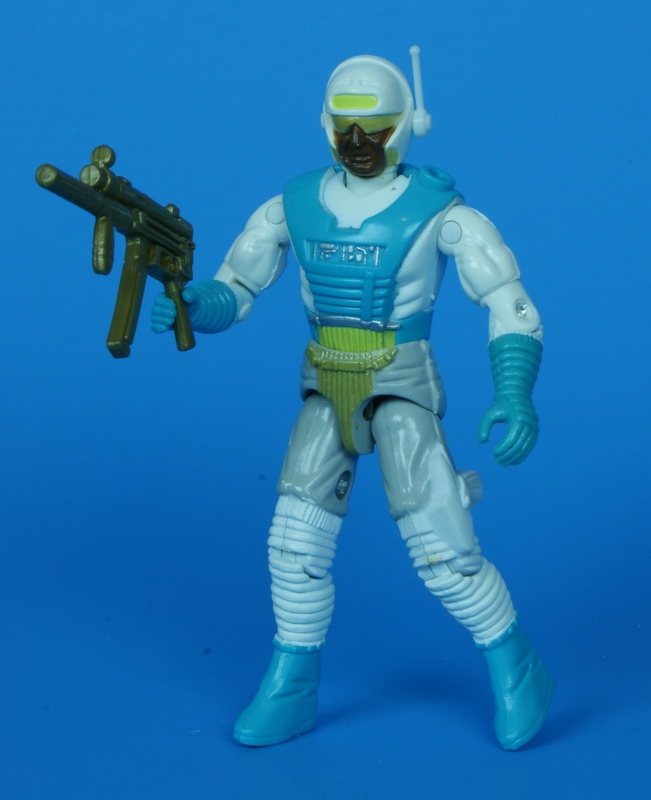 Not to mention he was the only figure in the Arctic Commandos set to be made by the Estrela factories in Brazil. I always thought that v1 Deejay’s biggest failing was his disjointed colour scheme. This one seems a little more thought out. I remember that I got the original Dee-Jay for my ninth birthday. Which was also the year I got my first NES set. Needless to say, Dee-Jay got mostly ignored. I was always fascinated with Dee-Jay just because he’s so vanilla. You could make up any story for him. Like an updated Steel Brigade before they updated Steel Brigade. Yeah, Dee-Jay…does he wear those boots because he doesn’t want to scuff up the HQ’s newly refinished hardwood floors?!? I guess if he’s working in a chip factory he would wear a protective clean suit to keep dust out of the production room, so maybe the booties aren’t so far-fetched–Except that he’s a tech-wiz soldier, not an engineer. This color scheme is much better than the first. By “chip factory” I mean making microchips and processors and such, not working for Frito-Lay’s! This repaint helps Dee-Jay a lot. Those legs are still ridiculous, but with a different lower half, he might be the perfect comms guy for the Joes’ arctic team. Is it just me, or does Dee-Jay look a lot like Stern? I once painted a fodder Dee-Jay head just to see what it looked like, and there was The King of All Media. Coincidence? Dee-Jay shelfwarmed in my area like no other Joe. Legions of them gathered like an alien invasion, occupying pegs. You had to pull them off or push them aside to see what other figures there were. For 2 years he was shipped. Yeah, the colors are better this time around. Arctic Commandos tended to have better or equally-good colors to their original. His outfit does look like working in a dust-free environment, like assembling space probes… if not for the exposed face. Yeah, that’s why he came in a separate bag IIRC. Or maybe the other Joes were shunning him, forcing him to travel in his own plastic bag LOL. I had Dee Jay back in the day. Bought him new in the store…. I tried to think of some way to make him cool, but it didn’t work. He got very little use in my Joe team….. I guess he is good for managing communications on the Defiant space shuttle. Battle Force 2000 figures made a good crew for space….